1 of 5 Heat oven to 325 degrees F. Butter two large baking sheets. 2 of 5 Place chocolate in microwave-safe bowl. Microwave for 1 minute, then stir until smooth. Let cool 5 minutes. 3 of 5 Beat butter and sugar in a large bowl until blended. Beat in cooled chocolate. Add eggs and beat until smooth. Stir in flour, salt and cocoa powder until a soft dough forms. Beat in mint extract. 4 of 5 Drop dough by tablespoonfuls onto prepared baking sheets. Bake at 325 degrees for 18 minutes or until dry on top. Transfer to wire rack to cool. 5 of 5 While cookies cool, combine white chocolate and oil in glass bowl. Microwave 30 seconds, stir; then microwave another 30 seconds. Stir until smooth. 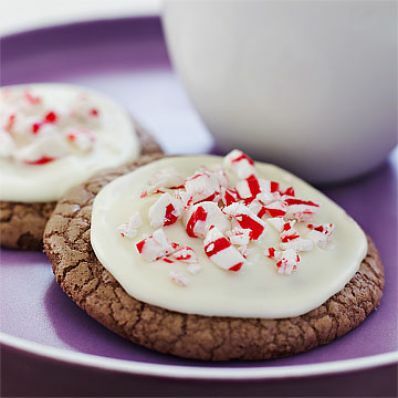 Spoon about 1 teaspoon white chocolate onto each cookie, then top each with 1/2 teaspoon of the crushed candies. Let stand to harden for 30 minutes. Store airtight up to two weeks. Makes 2-1/2 dozen cookies. Per Serving: 4 g sat. fat, 23 mg chol., 6 g Fat, total, 19 g carb., 29 mg sodium, 1 g fiber, 2 g pro., 135 kcal cal.